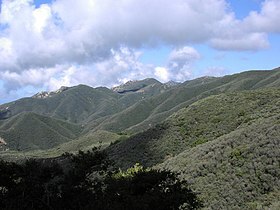 Chaparral is a shrubland or heathland plant community. It is found mainly in the U.S. state of California. Also in the northern portion of the Baja California peninsula, Mexico. It is caused by a Mediterranean climate (mild, wet winters and hot dry summers) and wildfire. A chaparral has summer drought-tolerant plants. They have hard sclerophyllous evergreen leaves. Chaparral covers 5% of the state of California. Of the associated Mediterranean shrubland, it covers an additional 3.5%. The name comes from the Spanish word chaparro, referring to scrub oaks. There are four other chaparral regions in the world. Chaparral does not often have fires. These are usually at intervals from 10–15 years to over a hundred years. Mature chaparral often has dense thickets. They are highly flammable. ↑ 3.0 3.1 "Hotspot; California on the Edge". California Academy of Sciences. 2005. Retrieved 10 June 2014. This page was last changed on 10 June 2014, at 18:27.